Here is my mandala for October and Halloween - or Samhain, as pagans like to call the festival on October 31 that marks the end of summer and honours those who have died. One of my new year resolutions for 2017 was to create a mandala each month to show the changing seasons and including things from my own garden. I was inspired to do that after I created a mandala for the front cover of the book Every Day Magic: A Pagan Book of Days - which I edited last year and is being launched in November this year. 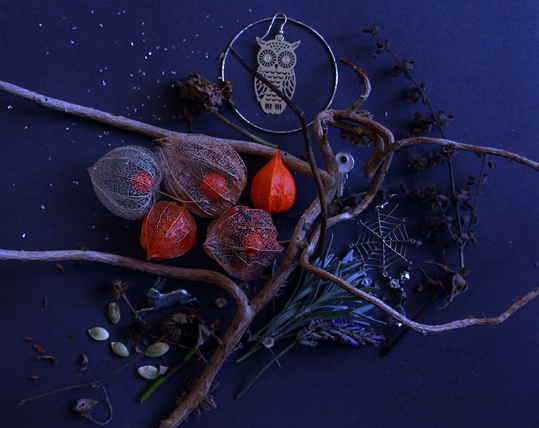 The mandala for my book cover used natural and found items, jewellery and trinkets that held a personal meaning for me. I enjoyed making it and it helped me explore the cycle of the seasons in a personal way, both from exploring my own garden in a search for suitable things for the craft project and thinking about what the Wheel of the Year actually means to me. Unlike my earlier mandalas, I set this one out on a background of black paper to represent the dark night of Halloween. The natural objects from my garden were a mixture of plants and flowers that had died back and gone to seed as well as some lavender, which is still just flowering. I had to include Japanese lanterns as they always remind me of this time of year and I think both the seed cases look wonderful when they are bright orange and when they are a skeletal filigree. I also used items from my jewellery box - some of which I haven't worn for a long, long while. Finally, I sprinkled a little silver glitter over it - but not any old glitter. This was from a tube of glitter leftover from my childhood days, long ago. I found it after my parents died, among their things, and have been keeping it for something special, like this mandala. You can view Every Day Magic - A Pagan Book of Days on Amazon. Yes indeed - thank you very much. I love the earrings!